"This was a recipe from my old Girl Scouting days. A very easy recipe for all ages that needs little adult supervision. Great for sleep-overs and backyard camping trips." Spray 4 sheets of aluminum foil, large enough to wrap bananas, with cooking spray. Slice the peel of the banana from stem to bottom, while slicing the banana inside lengthwise. The bananas can be cut into slices instead if you like, (while still in the peel) for easier handling later. Carefully open the banana just wide enough to place the chocolate chips and marshmallows inside the peel with the banana. Stuff with as much of the chocolate chips and marshmallows as desired. 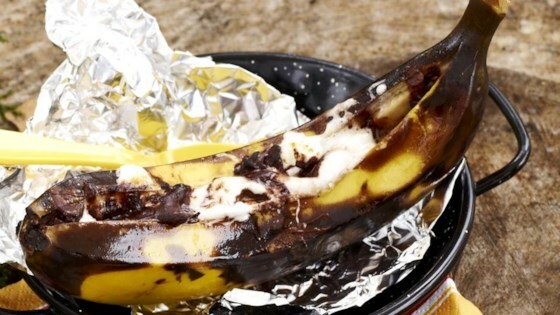 Wrap the bananas with the aluminum foil and place on the grill or directly in the coals of a fire. Leave in long enough to melt the chips and the marshmallows, about 5 minutes. Unwrap bananas, open the peels wide, and eat with a spoon. these are spectacular...but just so everyone knows eating bananas while camping will increase the amount of mosquito bites! These were terrible. I won't ever try these again, they tasted like melted plastic. Maybe I did something wrong. I don't think cooked banana peels are very edible. This recipe is so good!! Rather than placing on grill I place mine in the oven on 350 for just a couple of mintues or until the marshmallows are toasted/browned. 2 thumbs up!! These are wonderful! A nice change from s'mores. We do sometimes add peanutbutter also for an extra gooey treat.